Download this application note to learn how to integrate the SX-SDMAC product family to a customer’s schematic and PCB layout. 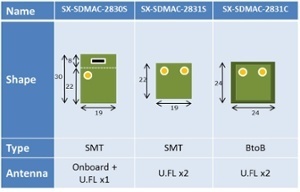 This application note explains the differences in specification between the SX-SDMAN-2830 and the SX-SDMAC-283X that customers should consider for their designs. Download this application note to learn how to update the firmware in the SX-ULPGN using Over-the-Air (OTA) Method. Download this application note to learn how to enable the FTDI JTAG Debugger on the SX-ULPGN-EVK. Learn the thermal profiles of the Silex SDIO radio family including the SX-SDMAN, SX-SDMAN2 and SX-SDMAC to allow users to design optimal thermal mitigation approaches during the integration of the radios. Download this application note to learn about the different ways you can save battery power using our latest 802.11ac SDIO radio module, the SX-SDMAC. Download this application note to learn the design requirements and considerations when migrating from the SXSDMAN-2830 to the SX-SDMAC-2830/2831 radio module. Download this application note to learn software and hardware recommendations for EMI issues you might face if you are using this product in your design. Download this application note to learn the steps required to bring up the the SX-PCEAN2 on the Sabre-SD EVK using the open source ath9k driver. This document explains how system administrators and users can use the Silex SX-BR-4600WAN Ethernet to Wi-Fi Bridge with virtually any Ethernet enabled device to allow connection to the organization's existing wireless network. Download this application note to learn how to implement the necessary changes to the OS and EVK board as well as how to install the Bluetooth stack using our AR6233 based SX-SDCAN wireless module with the i.MX6 platform. Download this technical paper to learn how to deploy Polycom VVX Phones over Secure Wi-Fi Networks. Download this application note to learn how to enable and demostrate "concurrent mode" on QCA6003 radio using our 802.11 radio evaluation kit, the SX-6K3-EVK-SD. Download this technical paper to learn how the new R&TTE rules impact the compliance of your products in Europe, and what steps are required maintain conformity and continue shipping into Europe. This technical paper describes the security methods, encryption, and authentication protocols supported by Silex Technology wireless devices as a solution to security threats inherent in WLAN networks. Download this technical applicaton note to learn the steps required to bring up the the SX-SDCAN on the Sabre-SD EVK using the NXP™ BSP. The purpose of this document is to provide a procedure to change a SX-ULPGN-EVK to a SX-ULPGN-EVK-AT. The purpose of this document is to provide instructions for creating a bootable SD card image based on NXP’s L4.1.15-2.0.1_ga BSP (Linux OS), and building QCA9377-3 (SX-SDxAC) kernel modules and the BlueZ package for the OS. This document is intended for developers or system integrators who are evaluating or developing Linux BlueZ based applications using the SX-SDCAC wireless module. It provides procedures for setting up a set of selected BlueZ profiles with the wireless module (QCA93767-3). This application note will outline how to enable and demonstrate a mode called concurrent mode, in which the radio will support two Linux network ports configured separate yet utilizing the same physical hardware. The purpose of this document is to provide a procedure for placing an SX-SDCAC (QCA9377-3) SDIO wireless module in different Continuous Tx test modes. The procedure will walk through the steps using an i.MX6SX (SoloX) SABRE SDB platform and NXP’s BSP L4.1.15_2.0.1-ga (Linux). The purpose of this document is to present findings on SX-SDCAC startup issue when used with the i.MX7 Sabre SD Board. The i.MX 7 appears to be an incompatible platform for evaluating SX-SDCAC. The purpose of this document is to describe the existing debug functions in the SX-SDxAC driver. This document focuses on two debug logging facilities in the SX-SDxAC source - AR_DEBUG_PRINTF() and VOS_TRACE(). This application note is to support migration from SX-582 to SX-590. For your practical product designing or development, refer to the product specifications.